Twitter has made my poetry more aphoristic. Formally, it’s a platform ideally suited to the aphorism; in fact aphorisms should be quite a bit less than 140 characters. Further, you can like an aphorism even if you disagree, or aren’t sure you agree. “RT ≠ endorsement,” as many Twitter bios attest, but nor does a like imply endorsement. Some tweets, of course, aspire to literal, factual truth—those that report on science or the news, for example. But others are more like essays or poems or novels that can’t, fundamentally, be true or not true; it’s a category error. Last spring, Jay Ritchie emailed me on behalf of Montreal’s Vallum magazine, asking if I might be interested in answering my own “12 or 20 questions” for the journal. I said yes, of course, even while pointing out that I had actually answered the questions prior, way back in 2008, near the end of the first series of interviews. So, from May 16-18, 2018, ten years after my first interview in the series posted, I worked on the questions for a second time. How much difference might a decade make? A lot, most likely. 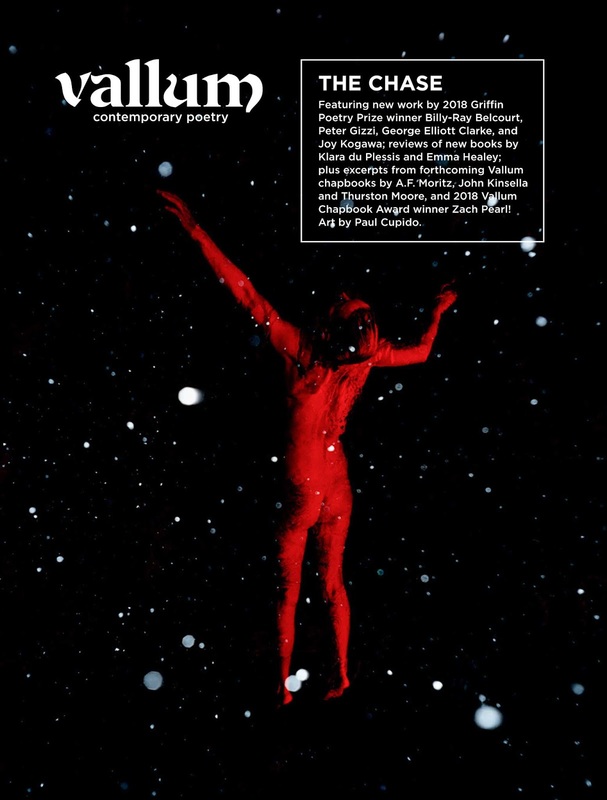 My interview appeared in their print journal last fall, issue #15.2, and appear here with their permission. I thank all the Vallum-ers for the prompt (specifically Jay, who did the prompting). Thanks. And, as always, I remind that I attempt to provide links to all of my interview posted online here, if you wish to check out further of my answers. I felt that the publication of my first chapbook, self-published in 1992, allowed me into a conversation. My first full-length collection in 1998 (as well as my second collection, a year later) provided me with the quick knowledge of what publishing a book of poetry meant in the larger culture, and exactly what it didn’t mean. There were some hard lessons, but some enormous opportunities as well. My most recent work feels hundreds of thousands of leagues away from those first published scribblings. In many ways, I barely recall who that person was. I sometimes shake my head at him. During my high school years I was engaged with poetry and short stories, photography and visual art, as well as attempting to teach myself guitar, and moving through what became thirteen years of piano lessons. I even sent a poorly-executed comic book script to Marvel when I was sixteen, and received a very polite, and, I daresay, generous rejection in response. Once my first daughter was born in January 1991 (two months shy of my own twenty-first birthday), I thought I should either write properly, or not at all. Around that time I’d seen a quote by Margaret Atwood along the lines of: if you want full-time out of it, you have to put full-time into it. I was young, stupid and broke, and couldn’t afford art supplies, so writing seemed the best route. I told myself I should focus on one thing, and figure that out. I chose poetry, telling myself that once I got a handle on that, I would branch out into another form, say, fiction or visual art. Those things did re-emerge, but not for some time after. I’ve only had a laptop since around 2010 or so, which allowed me to shift much of my poetry composition from longhand to keyboard. I suppose it was more a function of opportunity than design. I spent years composing poems longhand in the order they eventually sat on the page, despite how many dozens of drafts may have occurred in the process. These days, most of my poems evolve more organically, and often from the inside out. Lines are expanded, cut, moved around, sutured, picked at. Reduced. Poems may evolve from a line or a phrase or a word or a structure or an idea and then shape like a pearl around that first grain (or irritant, to continue the metaphor). I suppose I could also offer this as a microcosm of how my poetry manuscripts develop. Fiction emerges in fits and starts, in chunks. Some stories take months to find themselves, although I often work on two or three concurrently. Perhaps this is also, simply, a variation on what I’ve already described, but characters often emerge through threads I’ve collected that cohere slowly into a person and whatever situation they might be in. A parental death. A twin. Married. Two daughters. Etcetera. With enough threads woven in, other ideas suggest themselves. At times, the stories write themselves; I just have to be attentive enough to sit and listen to what I’ve already begun. Compared to, say, a decade ago, I’m far more comfortable sitting on something when it doesn’t feel entirely, exactly finished. To paraphrase Michael Ondaatje quoting Jack Spicer, in the introduction to The Long Poem Anthology (Coach House Press, 1979): the poems can no more live on their own than can we. I haven’t really thought in terms of the single poem since the early 1990s. Even my single poems see themselves as an eventual collection of single poems. I would say the same for my fiction. I write in terms of the full-length book as my unit of composition, and have for quite a long time. I enjoy doing readings, but they also fill me with a great deal of anxiety. I know writers who practice reading aloud before presenting work publicly, but I’ve always heard the work in my head during composition, so I’ve never read anything aloud before reading work before an audience. I’m also now at the point that I occasionally pull a pen from my pocket during a reading, for the sake of a quick edit. Sometimes there are still things that are only caught when reading aloud. That is something I’ve been contemplating far more over the past decade, after seeing how certain poets are able to articulate the political in their own works, from Stephen Collis to Jordan Abel to Layli Long Soldier to Morgan Parker to Sachiko Murakami to so many others. How does one attempt to articulate elements of the world in a productive way, especially without dismissing or excluding those voices that should be heard over my own? How can one simply be writing pretty lyric without including some of the darker elements of larger culture, from Idle No More to Black Lives Matter? I haven’t quite figured out an answer to such (and an easy answer is impossible), especially knowing that topics like these aren’t helped by me offering up my opinions. Sometimes this is the best part of being active on social media: I can forward those articles and such by those that should be heard over my nonsense, attempting to provide a signal boost. And then I think of Milan Kundera, who managed to include the social, the political, the personal, the sexual and the intimate equally throughout his own novels. This level of across the board engagement (as opposed to a novel focusing on one element over the rest) is a model for what I wish to eventually accomplish, especially with fiction. I’m not there yet. I’ve been years seeking out proper editors, honestly. Karl Siegler was great during my Talonbooks days, and Bev Daurio was a magnificent editor for my two novels with The Mercury Press. I was quite amazed with what Rolf Maurer at New Star did with A perimeter (2016): he actually blended elements of two unpublished poetry manuscripts I’d sent him and created a third, something that I remain stunned by and thrilled with, and wouldn’t have constructed as such. There wasn’t much in the way of line edits; more of a reconstruction, really. I was startled by the book that emerged. 10 - How easy has it been for you to move between genres (poetry to short stories to essays to the novel)? What do you see as the appeal? I’m rather fond of those works that shift between genre, and I would like to think I’ve made my own progress there, especially with my more lyric prose-fiction (which is occasionally mistaken for poetry, for reasons I don’t quite understand). I am fascinated by the blur. Also: I don’t exclusively read one type of work, so why should I be constrained to working the same? We’re in a bit of a transition as I write (mid-May), as our toddler has dropped her nap, losing my weekdays of some two to two-and-a-half hour daily stretches of potential writing. The four-year-old is in junior kindergarten full-time, but the toddler is in but two mornings a week of preschool. I think her mornings might have to increase, if I’ve lost that nap time. That loses me some ten to fourteen hours a week of writing time. 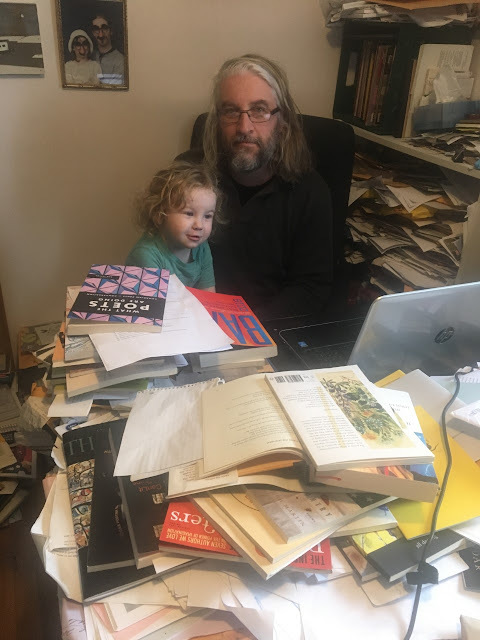 I am still adapting, I think, to this period of full-time home with small children, after some twenty-five years of full-time writing. While this time with the girls has been marvellous, I begin to itch for when the wee one begins her own full-time school, which should be more than enough to keep me productive. I can see the light at the end of the tunnel, but it remains a ways off. Moving through literary research on Ottawa’s Glebe neighbourhood recently, I took comfort in reading a 1970s article in the Glebe Report on then-local writer Carol Shields, who was writing some three hours a day when her five children were at school, but unable to work at all during weekends or over the summer. A typical day begins with making coffee, and putting the kettle on for oatmeal for the young ladies. I dress myself, and feed the children. Once they’ve eaten, I clean them both and get them dressed. If I can get Rose’s school lunch prepared by 8am, I know I might have time to read my morning newspaper. I check my blog once it posts at 8:31am and email and tweet out as required. We aim to be out the door by 8:37am, and Aoife and I drop Rose off at school (which is, fortunately, but three blocks away). On Aoife’s mornings, I drop her at preschool, and am at my desk by 9:07, for a two hour and ten minute stretch before leaving again to collect her. If I feel stalled, I sometimes move to another project. Sometimes putting a poem or story down to revisit it later is enough to rattle something loose. Other times I read. If I’m really stalled, I might ask someone else to look something over. I’ve said before that really good television or movies have often prompted my prose. An episode of Mad Men. The movie Smoke (1995). Given I’m home full-time with small children, my reading is months behind, but the list evolves, constantly. 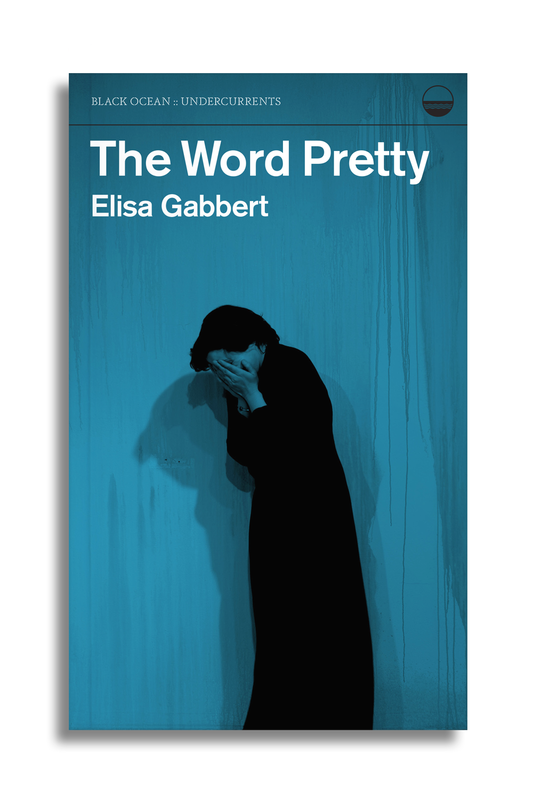 Recently, I’ve been quite taken with works by AliSmith, Evelyn Reilly, Emilia Nielsen, Cameron Anstee, Lydia Davis, Lorrie Moore and Maggie Nelson. Certain go-to writers over the past few years have included Sawako Nakayasu, Amelia Martens, Robert Kroetsch, Pattie McCarthy, Cole Swensen, Kate Greenstreet and Rosmarie Waldrop (which might contextualize some of my shift over the past decade into the prose poem). Discovering the work of Anna Gurton-Wachter last year was a gift. Really, my most cherished writer over the past decade or so has easily been Brian Michael Bendis, who allowed for a major shift over at Marvel Comics. I’m curious to see what he might do now that he’s moved over to DC. It means I might actually have to start reading books by DC. I wouldn’t mind a bit more travel, here and there. I can’t really think of too much else at the moment. It’s funny what threads fall away, and others follow through. How did I get here? Over the years, I’ve tinkered with music, visual art, photography and filmmaking (on both sides of the camera), as well as time spent as a farm labourer, kitchen staff, waiting tables and running a home daycare, but this is where I’ve ended up. I wouldn’t change a thing. I think, at this point I’ve convinced myself that I’m not much good at much else, although it’s more likely that I’d rather be doing this than just about anything. But in my twenties, writing seemed far more possible than most other arts, given it requires but paper and pen, and what has become that most elusive of properties: time. Some books that have struck me lately would include Layli Long Soldier’s remarkable Whereas (Graywolf, 2017) and Jack Davis’ Faunics (Pedlar Press, 2017), as well as Chelene Knight’s Dear Current Occupant: A Memoir (Book*hug, 2018). I say: wow. Oh my. Black Panther was incredible. We’ve seen it a couple of times now. I’m still poking away at a series of short stories, as well as my post-mother creative non-fiction manuscript, “The Last Good Year.” Earlier in the spring, I composed a prose-poetry sequence, “snow day,” that might end up shaping itself into the first section of a larger poetry manuscript. As of yet, I’m not entirely sure what that might look like, but I haven’t really the attention span for that at the moment. If and when something occurs, I’ll run with it as best I can, and see what comes. That’s how “snow day” emerged, as a brief idea that suddenly took over six weeks or thereabouts of writing before it was complete (and produced as a chapbook through above/ground press in March 2018, just in time for my birthday). Otherwise? Reviews, I suppose. Lots and lots of reviews. 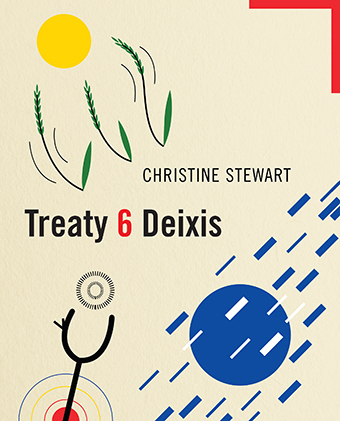 After years of itinerant publishing through small and smaller venues, Edmonton-based poet and critic Christine Stewart’s long-awaited debut is the book-length essay-poem Treaty 6 Deixis (Vancouver BC: Talonbooks, 2018). While this might be her full-length solo debut, Stewart is also the author of a full-length collaboration with Toronto poet and editor David Dowker—Virtualis: Topologies of the Unreal (Toronto ON: BookThug, 2013)—and an incomplete list of her chapbooks would include The Barscheit Horse [with Lisa Robertson and Catriona Strang] (Hamilton, ON: Berkeley Horse, 1993), A Travel Narrative (Berkeley Horse, 1994), Daddy Clean Head (Vancouver, BC: Lumpe Presse, 2000), From Taxonomy (Sheffield, England: West House Press, 2003), Pessoa’s July: or the months of astonishment (Vancouver, BC: Nomados Press, 2006), The Trees of Periphery (Edmonton AB: above/ground press, 2007) and The Odes (Nomados Press, 2015). In “Treaties Made in Good Faith,” Sharon Venne, Cree scholar and lawyer, rejects the Government version of Treaty Six: the Indigenous Nations of that territory never surrendered their land, their governments, their legal systems, their children, or their lives. Venne’s understanding of Treaty Six comes from her Elders, who have spoken to Venne, and who have cited the Elders who negotiated with the Commissioners at the signing of the Treaty, in 1876: “We are not selling our land. We cannot sell our land … We have a relationship with the land. The Creation placed us here on Great Turtle Island and this is our land. However, we will let you live on our land. That is, as the Elders explain it, the only way non-Indigenous people and their communities can inhabit Indigenous land is through the Treaty agreements. Which is not to say that non-Indigenous people (Canadians) don’t belong here,rather that we are here because of agreements that bind us (inexorably) to the Indigenous Nations and to the land, and that all Canadians are required (by law) to honour those agreements as they were originally intended, to know their Treaty rights and responsibilities: “to live in peace, to share resources: some of the land, some of the wood, some of the ground so that they can live on and respect the land.” As I understand it, in territories where there are no Treaties, it is our role to understand what negotiations are in place and to ensure that sound agreements and good relations are made and upheld so that we can fulfill our historic commitments to the Indigenous Nations. Stewart, who arrived in Edmonton in 2007 from Vancouver to join the faculty of the English and Film Studies Department at the University of Alberta, composes a poem very much on the foundation that it is everyone’s responsibility to know and understand the treaties that make up so much of our country, and to know precisely what the settler responsibilities of those treaties actually are. 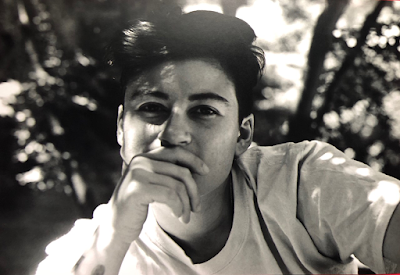 In many ways, it feels as though this is the project that Stewart has been working on since she landed in Edmonton, attempting to fully and respectfully understand and engage the landscape upon which she has become a small part.